The history of viticulture in Málaga stretches back to the Bronze age, when 3,000 years ago Phoenician traders transplanted Muscat of Alexandria from Egypt to Spain. These were the first vineyards ever planted in Spain, around the village of Malaka (present day Málaga), which they founded as well. Muscat of Alexandria is the oldest clone worldwide of the Muscat varietal. It is the original Muscat, which was cultivated extensively around Alexandria, Egypt, and planted in Málaga by Phoenician traders 3,000 years ago. Muscat of Alexandria is one of the world’s only remaining ancient (genetically uncrossed) grape varieties and the most important for commercial wine production. 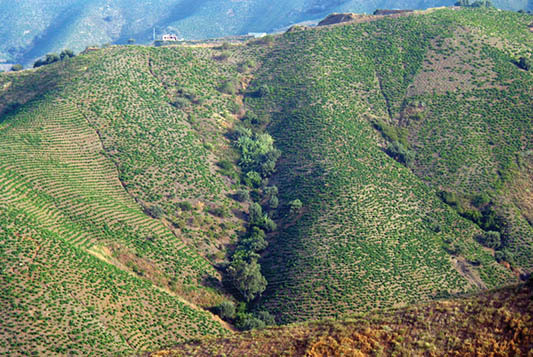 The vineyards of Málaga are perhaps the most extreme and dangerous in Europe, due to the decomposed slate soils, and inclines of up to 70˚. The vast majority of steep vineyards in Europe have terraces or are mechanized in some way to protect workers and assist with harvest. The vineyards in Málaga have remained untouched. All pruning and harvesting is done by hand, and mules carry six 15kg boxes up the slopes at a time. An absolutely heroic form of viticulture. The soils are extremely harsh and poor, characterized by decomposed schist (slate intermixed with quartz.) These soils are extremely slippery and make vineyard work very dangerous as the pieces of slate are extremely sharp. Primary source records exist from 600BC, when the Greeks controlled this area, that reference local viticulture. The Romans expanded viticulture in the area, and fermentation tanks from Roman times have been discovered across the region. In the 11th century, an Arab historical geographer wrote about “the mountains covered with vines, uninterrupted as far as Mt. Xolar, results in one of the most beautiful views in the world.” Although production of wine was originally banned under Moorish rule, after realizing the economic importance of wine production and tasting the wines, the rulers claimed the alcoholic drink was a medicine, and consumed it as such. In the year 1214, King Phillipe Augustus of France held a wine fair in Paris, where he tasted wines international wines for two months. He awarded the top honors to a wine from Cyprus, and second honors to a Moscatel from Málaga. 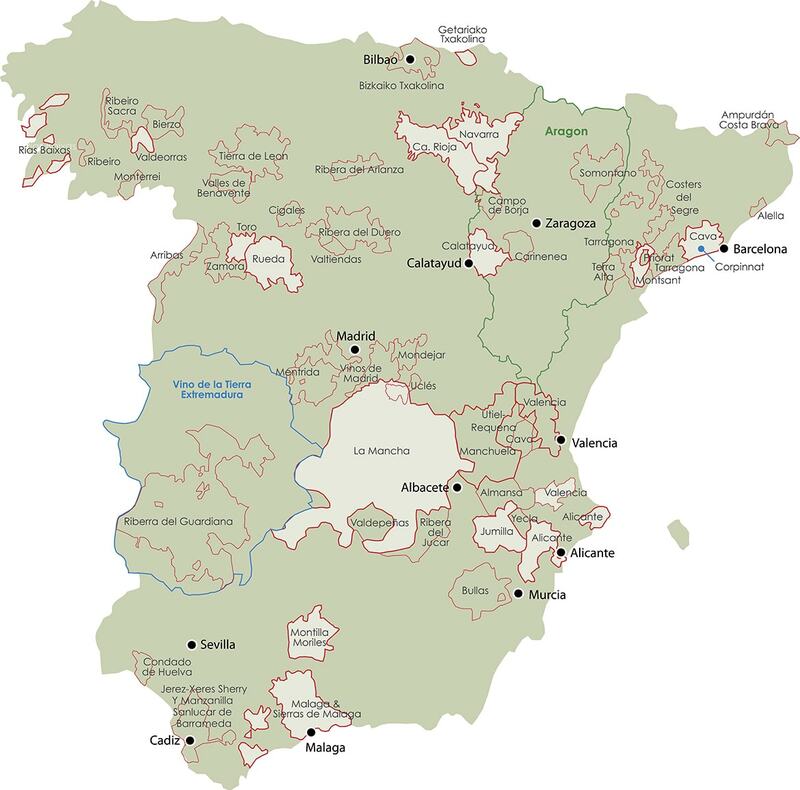 In 1502, after the Reconquista, Queen Isabella and King Ferdinand realized the economic potential of the Málaga wine export industry, and nationalized it, establishing the first Spanish brotherhood of vine growers – “Hermandad de Viñeros” in Málaga. Essentially – Spain’s first D.O. By 1622, the historian Martin Roa estimated that of the 20,000 barrels produced in the region, 15,000 were exported by ship to ports around the world. Additional historical proof can be found in the auction notes of James Christie on Sept 7, 1769 which list the sale of 400 dozen bottles of Oloroso Madeira, Hock Añejo, Burgundy, Calcavellas, Malaga, and Tent.